It's been such a fun week over here on Love + Specs for so many reasons that we're excited to share more about soon, one of which was Tuesday's post with Behr about our new budget-friendly seafoam-painted Adirondack chairs that we're loving having on our front patio. One of my favorite new pastimes is sitting in them at sunset and watching the neighborhood pups trot by. Best thing ever! Is it normal to be this excited about chairs? 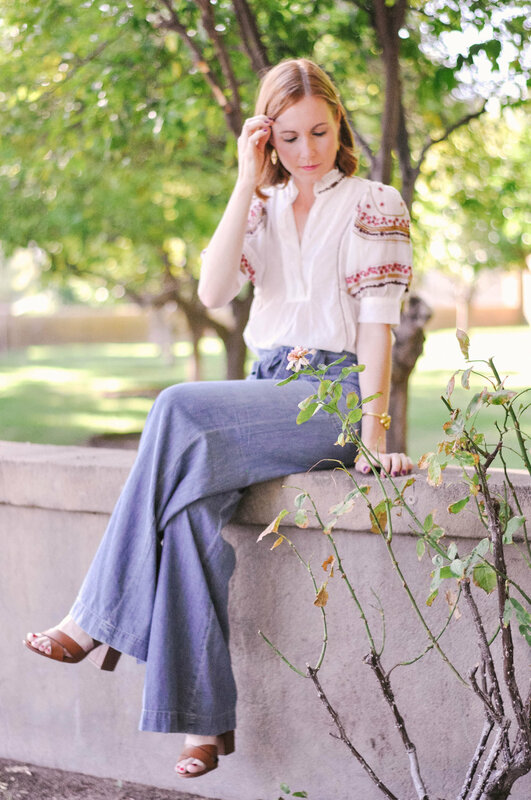 Today is a little bit of a selfish post because I feel like more than anything I'm feeding my own thirst for all things fall by offering some more fall outfit inspiration in a getup from one of my very favorite stores and "zen zones" in general, Anthropologie! Anthro's fall fashion game is always on point, and they've just scratched the surface of rolling out some of their new fall arrivals, and I'm loving every second of it and can't wait for more to come. 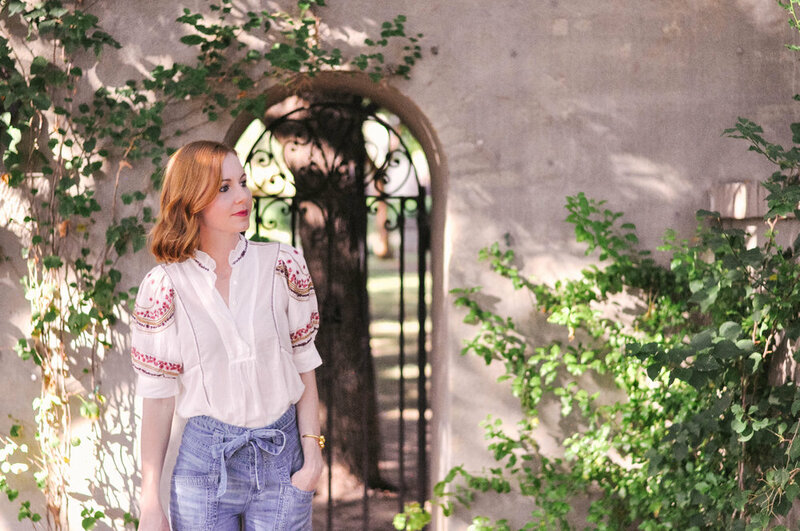 I've had my eye on this slightly Victorian embroidered high-neck blouse for a couple of weeks now and when I tried it on in the store, it was even better than I'd imagined. The fabric is so so soft and the embroidery detail paired with those puff sleeves are so much fun. I also adore the little ruffle collar. It also happens to include one of my favorite pretty fall color palettes that I look forward to wearing every year, rich rosy pink and marigold! As for these Pilcro jeans, well, they're bold. Really bold. I saw these bad boys on a table while perusing the store and really loved the oversized front pocket and of course, the high waist with a tie. Any denim that's high-waisted with a tie is off to a good start in my book. And then I saw just how wide that wide leg was after picking them up and I'll admit, I was intrigued. And intimidated. But mostly intrigued. And questions abounded. "Can I pull these off?" "Will I look insane?" "Will my shoe get caught on a pant leg and cause me to face plant and break my nose?" "Can 5 of me fit in there?" It was a lot. But nevertheless, I was determined to see how it would all shake out and marched into that dressing room with purpose. Luckily, the lovely Anthro staff member who showed me to my dressing room gave me a little boost of confidence when she said, "I hope you love those because they're just so awesome!" 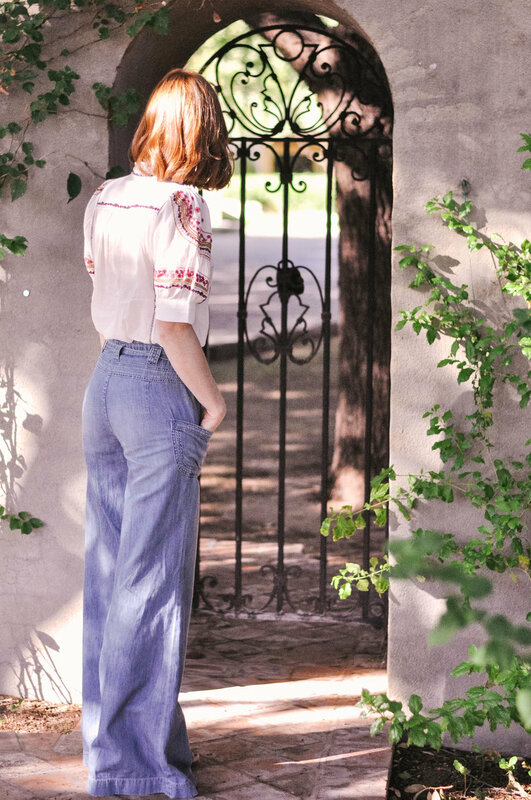 If you're an Anthropologie lover like I am, you know just how cool their staff is, so I felt like I was already on the right track if that boho goddess over there thought they were winners. After slipping them on I was pleasantly surprised that they were, in fact, some of the most comfortable pants that I'd ever tried on and that the fit was just right! The inseam would be slightly long for me if I were wearing flats, but I had no intention of wearing these wide-legged phenoms with flats, so with heels the inseam is perfect! I also really loved the fit of the high waist and after having them actually on my body, the gigantic legs didn't seem so ridiculous. It was, like that sweet girl said, pretty cool! 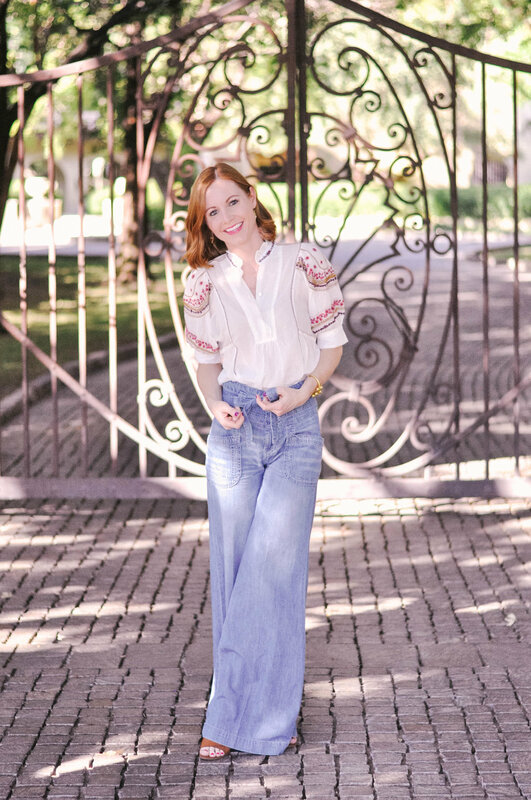 And I love getting out of my comfort zone once in a while when it comes to my style, so these are a really welcome addition to my typically skinnier pant selection! If you're as ready as I am to start shopping for fall, just get some fall outfit inspiration, or even if you're shopping for back to school (jealous! ), Anthropologie is a great place to start. There are a few fall jackets, many many midi skirts, midi dresses, lots of good denim, tops in pretty fall hues with lots of great detail and some awesome fall shoe beauties that have dropped at Anthro, and I rounded up a bunch of my favorites in the widgets above and below. On a side note, I also really love Anthropologie for elevated basics like this basic long sleeve t-shirt with some feminine ruffles and this v-neck t-shirt with statement shoulders. I also love Anthro for those all-important seasonal investment pieces like this parka jacket and this pair of MOTHER jeans that I'm absolutely in love with. A good green military-inspired parka is a staple in my fall wardrobe I love the faux fur on Anthro's take on the style this year! And for those of you who have asked on Instagram, yes, I totally cut my hair! I always like to change up my hair when the summer starts to wind down and fall's in sight, so I went a little redder and a little bit shorter this time around and I'm really loving it! I get a pretty blunt cut usually and I love doing that with a bob because it just makes it a little bit fuller and losing the layers allows it to look polished whether it's curled or just straight and air-dried. I hope you guys have enjoyed getting a little bit of outdoor living space inspiration paired with a little fall outfit inspiration this week! Is anyone else feeling the fall vibes this week? What do you guys look forward to most come fall? Tell me all about it in the comments section below!